In August 2015, Fulham FC, the oldest professional football (soccer) club in London began sporting shorts with the “Visit Florida.” What was originally a one-year deal was extended into 2016/2017 after tourism officials in the state made great boasts about the return on investment. The amount Visit Florida paid to Fulham, owned by Shahid Khan, who is politically connected in this state is said to be six figures in US dollars. It’s important to note Fulham does not play in the first division of English football (where the club competed from 2001 to 2014) but now in the second division. While Fulham is pushing promotion back to the Premier League right now the club plays in the English Championship which enjoys far less exposure across the globe than the top flight. For example, in the United States the Premier League is aired on NBC, NBC Sports Network, CNBC and USA Network. The Championship by contrast is shown on Al Jazeera-owned beIN Sports which is only in 17 million American homes. This pattern is repeated across the world. Khan bought Fulham in 2013 from Mohammed Al-Fayed the proprietor of Harrods for somewhere in between £150m and £200m (between $225-300m). Almost immediately, Khan was subjected to this xenophobic article by leftist writer David Conn of The Guardian (whose self-righteous anti free market and foreign capitalist rants when writing about football often undermine his good investigative work) and had to prove that he understood the sport to fans who are generally skeptical of anything American or even upper-class. 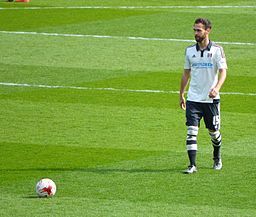 But at the end of his first season in charge of the club, Khan’s Fulham FC were relegated to the Championship, the second tier of English football. It is estimated the value of Fulham FC tumbled after the relegation and perhaps Khan needed to sell an easy sponsorship and seems to have done so with the use of his political contacts. Still the relatively small investment of Visit Florida likely means it’s at worse a net wash for the state. Enough fans in London or of an opposing Championship clubs (or perhaps Premier League clubs who face Fulham in cup matches) see the Florida sponsorship for it to be worthwhile – at least marginally. This season, Premier League club West Ham United moved into the London Stadium, an oversized facility not optimized for football. This has impacted the play of West Ham United in the initial portion of the 2016-17 Premier League campaign. The classic English club (which boast an active following in East London and across the globe) has had several high profile matches already this season beamed worldwide on mainstream television channels that have featured a prominent sponsor – Experience Kissimmee. This partnership makes a lot of sense – even for American audiences. West Ham United has had already this season, multiple games this season featured on NBC over-the-air affiliates throughout the United States. Additionally, West Ham has had home games on NBCSN and CNBC in the last few months. As a result Kissimmee has gotten exposure to domestic audiences as well to English ones and further flung areas.This deal has without question improved visibility for the tourist attractions in Osceola County and has to be considered a good expenditure. There are others besides Pitbull who are picking Floridians pockets on behalf of the filthy rich Florida tourist industry. Agreed. It’s also now becoming a scandal, the PitBull thing. More on that to come I am sure! This is no “partnership;” it is predation. Florida’s tourism industry is filthy rich … it needs no assistance from taxpayers to pay for advertising. The industry traditionally pays its workers abysmally, denies them healthcare, sick days, paid vacations, etc. Picking those same workers’ pockets on the behalf of wealthy sports moguls and entertainers is unconscionable.